Over the last 18 months, I have tried 4 sets of rules for the Napoleonic era. Le Feu Sacre and Field of Battle (Piquet) both readily lend themselves to solo wargaming as they are card activated and LFS uses blinds which is a real bonus. Both have excellent and well populated forums, where one can get answers to questions within a couple of hours and really without exception everyone is quite helpful. I found the mechanics of LFS somewhat fiddly and I did not like their basing scheme. The rulebook is so....so. I like FoB, it gives you a very exciting game and the mechanics are readily understandable with a good rulebook, I will definitely keep it on top of the stack. Republic to Empire, I am sure, is a great set of rules; the detail is amazing and I suspect quite true to Napoleonic warfare. It is a bit of work though, and for a solo wargamer without anyone to bounce questions off, I found it a little tiresome. Their forum is less populated, and at times I have found the posts somewhat contradictory although it is usually a very small number of people who actually offer rules clarifications. I get a general sense of defensiveness from some members of the forum about the ruleset, not really sure why. I do believe the rule book is a little confusing, but I am a very inexperienced wargamer so it is probably me. I believe if I was not playing solo; ie. I did not have to do all the heavy lifting myself in figuring out how the rules worked, I might be more interested but for the moment I am going to keep them on hold. Lasalle is really a great product; the rulebook is quite accessible and throughout are superb diagrammes. The mechanics are very simple but at the same time quite elegant. I find the Army Builder in the book quite useful for imposing some order on my somewhat chaotic approach to building armies. The forum, in association with the rules, took off very quickly. You really can get clarifications quite quickly, but are generally unnecessary as the rulebook is quite clear and well laid out. There are very many members and they are from all over the world, it is quite interesting. The rules are not as exciting in playing solo wargaming as is FoB. Igo-Ugo, just is not great for playing by oneself. 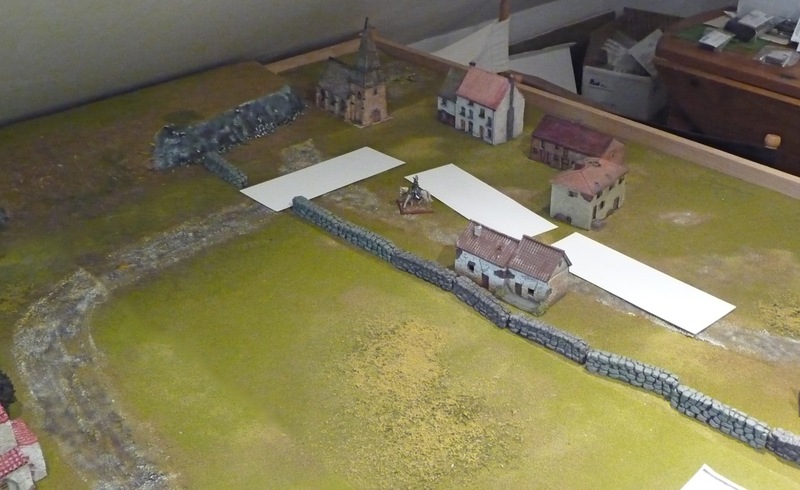 Recently on the Lasalle forum, I came across a post from Mike48 a solo wargamer in Belgium, who appears to have modified the ruleset to have blinds and card activation. I do not have all the details of his modification yet, I believe Mike is going to post an AAR soon, but I thought why not give it a go myself. In Lasalle, there are alternate turns, with a well designed sequence of play. In a general sense, there are 4 steps: You REACT first to the moves your opponent has made in his turn; You resolve any COMBATS that have come about; You than have an ACTIVITY phase where you move or maneuver your forces and finally you reassess the STATUS of your forces and add reserves if any. The other side then goes in the same sequence. So what follows is my first clumsy attempt to graft these two ideas on to Lasalle. I have really tried to leave as intact as possible the rules themselves. So first with the Activation Cards, I decided to give each sub-commander and commander a card. The sub-commander's card activated his specific brigade, while the commander's card activates any of his brigades or independent units. So essentially when a card is drawn that brigade goes through the 4 phases of it's turn, followed by the next card and so on. Going through a deck of cards is one turn, they are re-shuffled and you start again. If the Commander is killed or wounded his card is removed from the deck. Each deck is the equivalent of a turn in Lasalle speak. I then had to set up the blinds, being assigned to only one side depending on the scenario. If there were 2 forces (2 brigades), than 3 blinds were set on the table (numbered face down), one being a dummy. I used cards the approximate size of the footprint of the brigade. Pretty straight forward. These cards would move at column of march rate upon the drawing of any Activation Card belonging to that army. Finally, I had to design a mechanism to reveal (spot) each of the blinds. This is where I had to use skirmishers in a novel way, outside of the rules of the game. I treated them as an irregular force according to the optional rules within Lasalle. They were treated as an independent force under the command of the CinC. They were never treated though as out of command, and could travel up to 8BW in a move. I felt that a unit of rifleman or voltiguers could travel further than an infantry unit in a column of march (6BW) in a single turn. I also allowed them to keep their formed range fire at 8BW if using rifles, even though they were generally being treated as an irregular unit. As they were irregular, I allowed them to move in any direction without penalty. They had to keep within 1BW of each other, and their 4 bases (2 figures per base) had an equivalent firing power of 2 bases, so under unmodified conditions, they would throw 2xD6. Their specific orders would to go forward and spot the enemy and than return as quickly as possible. Once within 2 BW of the CinC they could be given new orders. Which of course, could include joining an infantry battalion to enhance their SK value. Small units of light cavalry could also be used. Spotting can be quite straight forward, and was when the scouts came within 8BW's of one of the blinds. The blind would than be immediately revealed and the forces associated with it would be placed on the table. A D6 was thrown to decide if they were revealed in Column of Attack or Column of March (=/>4 being column of attack). Once 2 of the 3 blinds were spotted, the last blind was also revealed. Well it sounds pretty simple, but I am not really sure how the phases of each turn will go, so I decided to set up a simple scenario to test my idea. I have ran through 6 turns (decks) so far and everything appears to be quite smooth, but no close combat has yet taken place, so we will have to see. I will describe the scenario and post an AAR in my next post, but here is the initial layout. So here we have the 3 blinds representing the 2 French brigades, we can see their lonely CinC Général de Division Lapisse. Here is the unblinded British army. 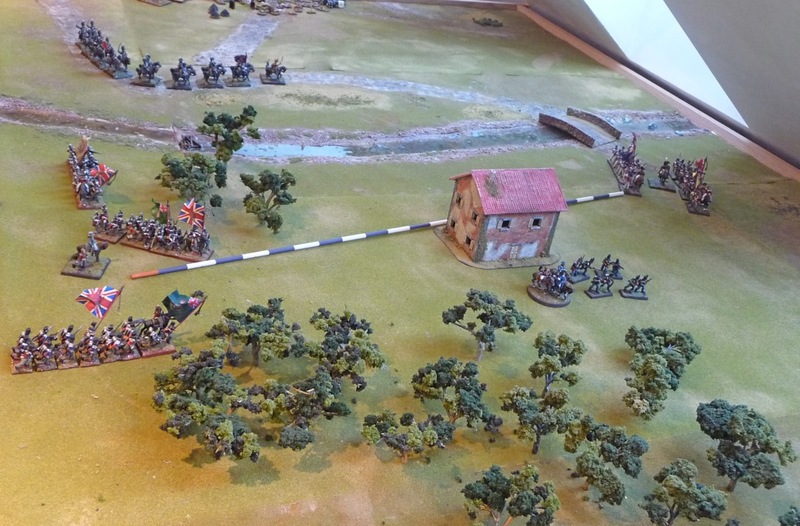 We can see their CinC Wellesley giving command to the 5/60th rifles to reconnoitre to the east. There is a small infantry bde to the north and a slightly larger one to the south. In the far west, across the river we can see BdeGen Anson's cavalry bde. I found that an interesting read as I am also pondering which set of rules to use. I think I may well order myself a set of 'Lasalle'. Chances are that I will also be playing solo when the time comes for a few games. Some of the mechanisms of the older rules that I have been considering are somewhat 'tired' now and things have moved on so I think its time I took the plunge. Looking forward to the battle report. Thanks Lee, I would recommend that you register on the Honour forum at www.sammustafa.com and have a look, the game so far is flowing smoothly. We are about to get into some close combat so that will be the true test. Thank you both, I will register at the forum. While I have yet to really play them, I like the LaSalle ruleset and will also join the forum to learn a bit more. I am still enamored with the simplicity and command structure of Black Powder rules and have been using it with 6mm ACW on a solo basis. I have become a fan of rulesets that incorporate a variability of command so that a level of risk / surprise is built into every action. I feel such variability is a must for solo play to keep one interested. My club uses a home grown set of rules for Napoleonics that feature a modified IGO / UGO movement sequence - a deck of cards. One side is red, the other black. If a number card is drawn that side can move one units, if a face card then two units. If the joker is pulled then all units on that side can move. Once one side has moved all it's units or declared the turn complete, the remaining side gets to move any unactivated units. While simple the mechanism adds a nice amount of variability, especially when one is amassing units for an assault.